The complex and characteristic structures of dendrites are a crucial part of the neuronal architecture that underlies brain function, and as such, their development has been a focal point of recent research. It is generally believed that dendritic development is controlled by a combination of endogenous genetic mechanisms and activity-dependent mechanisms. Therefore, it is of interest to test the relative contributions of these two types of mechanisms towards the construction of specific dendritic trees. In this study, we make use of the highly complex Vertical System (VS) of motion sensing neurons in the lobula plate of the Drosophila visual system to gauge the importance of visual input and synaptic activity to dendritic development. We find that the dendrites of VS1 neurons are unchanged in dark-reared flies as compared to control flies raised on a 12 hour light, 12 hour dark cycle. The dendrites of these flies show no differences from control in dendrite complexity, spine number, spine density, or axon complexity. Flies with genetically ablated eyes show a slight but significant reduction in the complexity and overall length of VS1 dendrites, although this effect may be due to a reduction in the overall size of the dendritic field in these flies. Overall, our results indicate no role for visual experience in the development of VS dendrites, while spontaneous activity from photoreceptors may play at most a subtle role in the formation of fully complex dendrites in these high-order visual processing neurons. The mechanisms that underlie the development of the nervous system are numerous and diverse. Over the past several decades, research has begun to give us a sense of the importance of both preprogrammed, invariant mechanisms for neural development, and also programs for development that depend on experience and the electrical activity of the developing neurons themselves. The fact that certain types of neurons develop their basic morphologies even when isolated in culture from other cells provides a simple but powerful argument for the importance of cell autonomous mechanisms in the establishment of neuronal structure [1, 2]. These and numerous other experiments have provided overwhelming evidence that neurons possess endogenous, activity independent programs that account for important aspects of their development. On the other hand, neurons deprived of contact with or activity from their normal synaptic partners seldom attain a fully mature structure. For example, Purkinje cells deprived of their efferent projections in Weaver mice have dendritic arborizations that do not extend normally . Additionally, the structures of neurons can be affected by an absence of activity from their efferent partners, even if those partners are present. This phenomenon of activity dependent neuronal development has been studied particularly effectively in the visual systems of various model systems. For instance, Xenopus tectal neurons have simple dendrites until the axons of their efferent partners in the retina arrive to innervate them. At this time, the dendrites elaborate into their mature structures. A pharmacological block of certain activity from the efferent neurons prevents the elaboration of the tectal dendrites, indicating that activity plays a critical role in the processes by which these tectal neurons attain their mature morphology . These and other studies have established a role for environmental input and synaptic activity in the development and maturation of dendrites, but the importance of these inputs varies among different types of neurons and different model systems (reviewed in [5–7]). Moreover, many of the mechanistic details of activity-dependent dendrite development remain elusive. Genetically advantageous model systems like Drosophila and C. elegans offer tools such as the genetic ablation of targeted cell types and temporally and spatially controlled blockades of neural activity. This line of research has been restricted by the fact that the best dendrites for study (those that are highly complex and stereotyped) have been described in vertebrates, which are not easily amenable to genetic manipulation. Neurons described in Drosophila and C. elegans have been simple, highly variable, or both. One exception is provided by the multiple dendrite (MD) neurons in the Drosophila embryonic peripheral nervous system. The dendrites of these neurons, which are fairly complex and highly stereotyped, have yielded important information about the genetic program controlling dendritic development [8, 9]. However, the MD neurons are primary sensory neurons, and as such, their dendrites are not postsynaptic to axonal input. This limits their usefulness in studies of synapse formation and activity-dependent dendritic development. In an effort to facilitate dendritic studies, we have used the MARCM system to label individual neurons  and have recently characterized the six neurons of the Vertical System (VS) in the lobula plate of the Drosophila optic lobe . As they serve as integrators of visual information from wide areas of the eye , VS neurons have highly complex dendritic trees that sweep over a large part of the lobula plate. In addition, their dendritic trees are highly stereotyped from animal to animal and are individually identifiable . They also exhibit easily distinguishable spine-like structures  that have been shown in blowfly to be enriched for post-synaptic densities  allowing for potential analogies to be drawn to dendritic spines in vertebrate neurons. Also like vertebrate dendritic spines, whose actin-mediated changes in morphology may be important for connective plasticity (reviewed in ), the spines in VS cells are rich in actin , supporting the idea that they could serve similar functions in the insect VS neurons as in numerous types of neurons in vertebrates. Vertical System neurons' extraordinary dendritic complexity and consistent structure from animal to animal should make them well suited for quantitative analyses. In the current study, we test the role of activity in the development of one particular VS neuron, VS1. We use two approaches to interfere with input into VS1: dark rearing, and genetic ablation of the eyes, and compare the VS1 dendrites in these flies to wild type light reared flies. We have recently described the cells composing the Drosophila Vertical System in structural detail . Our conclusion was that there are six VS cells in each Drosophila lobula plate, and that they bear a close structural resemblance to the well characterized VS neurons in blowflies and house flies [14, 16–19]. Each cell has a complex elaboration of dendrites in the lobula plate with axons that travel medially and terminate near the esophagus. Because different neurons of the Vertical System have different characteristic structures and levels of complexity , it was necessary to select a single type of VS neuron for quantitative analyses. We have restricted our quantitative analyses to the VS1 neuron because it is unambiguously recognizable, highly stereotyped, and has the most complex dendrites of any VS neuron . The VS1 dendrite is characterized by a main dendritic shaft that produces one or a few dorsally projecting branches before sweeping ventrally. As the main shaft extends ventrally, it continues to produce smaller branches that combine to form a narrow band covering the medial part of the lobula plate (Fig. 1A). Effects of input deprivation. The VS1 dendrites of a wild-type 12L:12D animal (A). No defects are apparent in the dendrites of a dark-reared (24D) animal (B). VS1 dendrites in an animal expressing GMR-hid are shown in panel (C). The dendrites cover an approximately normal field and have a diameter similar to those in wild-type 12L:12D flies. Although certain aspects of the branching pattern are abnormal in this neuron, these types of defects were mild and inconsistent. Scale bars are 25 μm. D = Dorsal, V = Ventral, M = Medial, and L = Lateral. 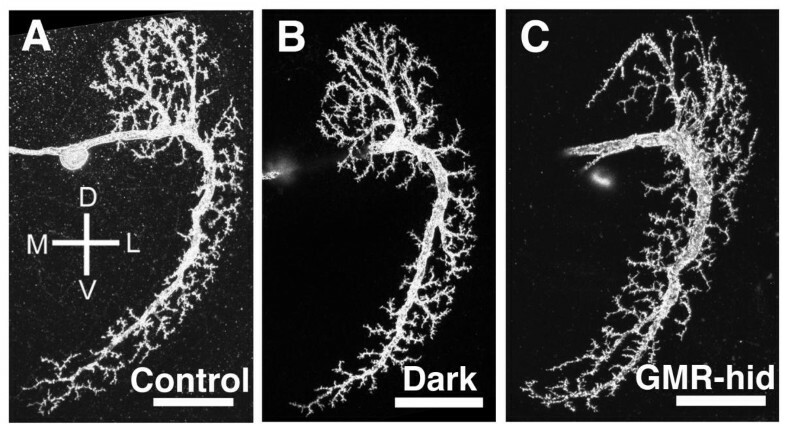 In order to define quantitatively some aspects of the dendrites' structure, we first obtained three-dimensional confocal images of VS1 dendritic trees, and then traced the dendrites to produce three-dimensional computer diagrams of the dendrites. From these tracings, we measured dendritic branching complexity based on the total number of branch points found in the dendrites of single VS1 cells. We also used the tracings to determine the combined length of all of the dendritic branches for each cell. Given the high stereotypy of VS1 dendrites, we used VS1 to study the effects that sensory experience may have on the development of dendrites in the Drosophila visual system. We compared the dendrites of flies raised on a 12 hours light, 12 hours dark cycle (12L:12D) to those flies raised in constant darkness (24D) from larvae to at least 48 hours after eclosion. This period of darkness spans from before the development of adult visual structures to after the critical period for visual system plasticity . VS1 cells appeared to be unchanged by dark rearing. The overall shape of the dendrites and the field that they cover was the same as in 12L:12D animals (Fig 1A,1B) and the complexity of the dendritic trees was unchanged in dark-reared animals (Table 1). The finer structures of the dendrites were also grossly similar in the visually deprived flies (Fig 2A,2B) and there was no significant difference between the two groups for spine number or spine density (Table 1). Given no apparent effects of dark rearing on the dendrites of the VS1 neuron, we looked at the axons to see whether the output from these cells might be affected by a lack of visual experience. As for the dendrites, the axons appeared to be similar in visually deprived flies and normal flies (Fig 3A,3B). Quantitatively, there was no difference in axon complexity between the two groups (Table 1). These results showing no changes in axon or dendrite morphology are consistent with a recent study showing normal physiological function of these neurons in dark-reared blowflies . Dendritic spines in dark-reared flies and flies lacking eyes. Close views of the ventral tips of dendritic trees are shown for 12L:12D flies (A), 24D flies (B), and GMR-hid flies (C). No defects in spine density are apparent. Selected spines are indicated with arrowheads in all panels. Scale bars are 10 μm. Axon termini are unaffected by experience and input. The termini of VS1 axons are shown. The overall complexity is similar for 12L:12D flies (A), 24D flies (B), and GMR-hid flies (C). The slightly longer dorsal projection in panel B (arrowhead) is well within the normal range seen for VS1 axons. Scale bars are 10 μm. D = Dorsal, V = Ventral, M = Medial, and L = Lateral. Values are shown +/- SEM with experimental n in parentheses. t-test was used to measure statistical significance compared with wild-type. *: p < 0.01, all others: p > 0.05. n varies within a genotype because different measures require different image quality. All quantitative analyses were restricted to VS1 neurons. Apart from the possibility that VS1 dendritic development is independent of synaptic activity, it is possible that spontaneous activity generated in visual circuits is sufficient to promote VS1 dendritic development. However, the neural elements that directly innervate VS dendrites are not fully characterized. To determine whether spontaneous activity from the eye plays a role in the normal formation of higher order visual dendrites, we made use of a GMR-hid transgene (the Glass Multimer Reporter driving expression of the head involution defective gene) that causes expression of a cell death protein specifically in the eye-imaginal disc as soon as photoreceptors are born. This system has been shown be efficient in killing photoreceptors at early stages of their development [22, 23]. Although covering a similar dendritic field (Fig. 1C), we found that dendritic trees of VS1 cells in GMR-hid flies showed a slight but significant decrease in dendritic length and branching complexity as compared to wild-type 12L:12D flies (Table 1). The dendritic structures of these VS1 cells were slightly abnormal in some cases (Fig 1C), but these defects were mild, and inconsistent. There were no significant differences seen in GMR-hid flies for any of the other parameters that we studied, including spine number, spine density (Fig 2C and Table 1). Further analyses revealed no significant changes in the average length of individual dendritic segments or in the branching order structure for VS1 dendrites in GMR-hid flies (data not shown). It is well known that in Drosophila the development of second order neurons is dependent on photoreceptor axon innervation (reviewed in ), and indeed we noted a reduction in the size of the lamina in GMR-hid flies (data not shown). One explanation for the reduction in VS1 dendrite length in GMR-hid flies is that the entire lobula plate may be smaller, as previously described for eye-ablated animals . If this were true then a VS1 cell could innervate its lobula plate normally, but would have less total dendritic length. To test this possibility, we measured the length of the dorsal-ventral axis on the dendritic trees for wild-type 12L:12D flies versus GMR-hid flies. We saw a slight decrease in the length of this axis from 112.7 μm in wild-type (n = 10) to 102.5 μm in GMR-hid flies (n = 5, t-test p = 0.111), indicating that the decrease in dendritic length may be due at least in part to a decrease in the size of the dendritic field in these animals potentially caused by reduction of lower order visual neurons. Further supporting the idea that these neurons are essentially normal is the fact that the axon termini in GMR-hid flies were unaltered in appearance and complexity as compared to control and dark-reared flies (Fig. 3C and Table 1). Past work in cockroach has shown a more dramatic role for input in the structure of efferent dendrites. Mizrahi and Libersat deprived cockroach sensory giant interneurons of input through direct deafferentation, and observed an average reduction of 55% in a variety of measures of dendrite complexity . These more severe effects are likely due to the fact that the cockroach neurons were directly deprived of their presynaptic partners, while the VS1 neurons analyzed in this study were affected only indirectly. These combined results imply that the structural complexity of these large dendritic systems rests heavily on the presence of presynaptic partners, and less on input to the system on the whole or activity in upstream circuitry. In conclusion, these experiments show no role for experience in the development of these complex high order visual processing neurons. Dark-reared and visually experienced flies possessed VS1 neurons with similar dendritic morphology, complexity, and spine structures, and similar axon morphology and complexity. Flies lacking photoreceptors showed similar neural structures, with only a slight reduction of dendritic branching complexity and overall dendritic length. Taken together, it seems likely that the dendritic morphogenesis of VS1 (and likely other VS neurons) is largely determined by internal genetic programs combined perhaps with the local environment in the lobula plate. Drosophila melanogaster were grown on standard media at 25°C. During clonal analysis, larvae that hatched over a two-hour interval were moved to plastic vials containing approximately 10 ml of food. Larvae were kept at a concentration of 80 per vial. Mitotic recombination was induced via heat shock (40 min in a 37°C water bath, 30 min at room temperature, 40 min in 37°C water bath) at two and three days after hatching. Adult female flies between 2 and 5 days after eclosure were dissected, fixed, and stained as described . Genotypes used are hs-flp / + ; FRT G 13, tubP-GAL80 /FRT G 13, UAS-mCD8-GFP ; GAL4-3A / + or hs-flp, UAS-mCD8-GFP / + ; tubP-GAL80, FRT 2A/GAL4-3A, FRT 2Afor wild type flies (12L:12D and 24D), and hs-flp, UAS-mCD8-GFP / + ; GMR-hid / + ; tubP-GAL80, FRT 2A/GAL4-3A, FRT 2Afor flies with ablated eyes. Dark-reared flies were moved to dark boxes at 25°C three days after larval hatching, before adult photoreceptors are born and before any connections are made. Adult heads were removed under a safelight and fixed prior to dissection. A Bio-Rad MRC 1024 laser scanning confocal microscope and the Laser Sharp image collection program were used. Images were prepared using Adobe Photoshop. Three-dimensional traces of the dendrites were produced from confocal stacks using MicroBrightField Neurolucida software (as in ). Briefly, dendritic branches were traced such that turning points, branch points, and endpoints were specified in X, Y, and Z positions within the confocal stack. MicroBrightField NeuroExplorer software was then used to give quantitative measures. Branching complexity was measured as the total number of branch points in the dendritic tree, and total length for these traces was defined as the combined length of all of the branch segments (as in ). In quantifying spines, we included terminal segments from 1–3 μm long, since these were the structures with the most dense postsynaptic terminals as previously described using electron microscopy . Our efforts to develop a postsynaptic marker as a means of quantifying spines were unsuccessful. Structures longer than 3 μm were treated as dendritic branches. This work supported by National Institutes of Health grants R01-NS36623 (to L.L.) and TR32-HD07249 (to E.K.S.). Concepts and experimental design were the combined work of E.K.S and L.L. Experimental work was performed by E.K.S. and J.E.R. Imaging was carried out be E.K.S. Writing was the work of E.K.S. with some contributions from L.L. All authors read and approved the final manuscript.